No explanation necessary. Poorly focused. Rosidah — I used a zoom lens. I didn’t want to get too close! Okay I’ve got to say it the only thing wrong with this photo I thought was it’s upside down. 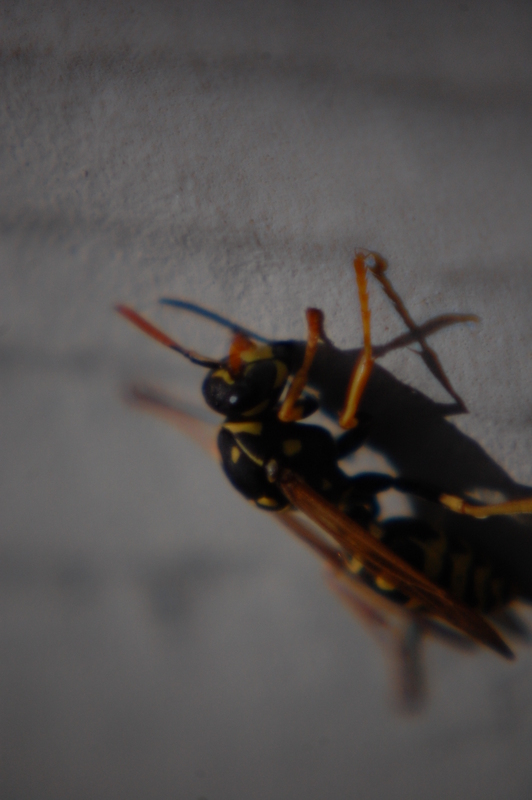 LOL I mean yes the outside around the wasp is blurry but other than I’d be proud of it. Thanks for playing. Thom — the wasp was on the house siding at about knee level. I took this photo from above it looking down. And you wanted a picture of this because why?! Is that a roach? Linda — wasp — and because I could! DJ Kathy — thank you. I once had a professional stop me from taking formal classes. He said if I didn’t want to go pro, all the knowledge would do is mess up my natural instincts and mold me into a business photographer rather than an artist. Ditto the above comments. And, ewwww, I hate bugs with a passion — focussed or unfocussed! lol. Gigi — living in Hawaii makes it easy to hate bugs. I don’t mind them outside where they belong, but I detest them in my home! That should satisfy Mr. Bite Me. Doug — not that he would admit it! Mama Zen — your “art” is my “oops”! Some of what I thought were mistakes have ended up being my favorites. Interesting post proposition. Monkey Man — I have a spectacular hummingbird shot like that. Barbara — I did, too. shhh …..
Traci — please join us. The more folks we can make fun of, the happier we are! I have to second Rosidah’s comment. I hope you used a zoom lens. Karen — a zoom lens it was, but I still stood pretty close. I am allergic to bees, but wasps don’t bother me. It is a different type of venom. I’m glad it wasn’t any more in focus than that! Karen — it was a zoom lens. The poor little thing was a couple of feet away. I really dislike flying, stinging bugs…but this is not such a bad shot. It would be better if the bug was an ex-living bug! Did you give her some beer ? she looks boozed ! lol !